TL;DR: We studied 63 SaaS companies, comparing how connected their employees were to the financials and goals of the company and the company's growth rate. 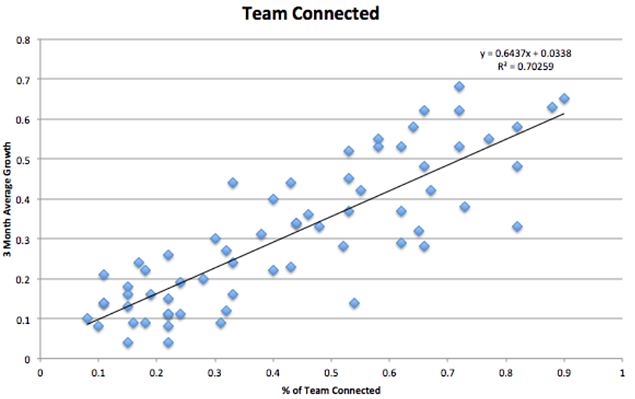 Companies with higher percentages of the team connected were growing at a much higher month-over-month rate. When we work on SaaS pricing and revenue models for our customers, we’re often speaking with the C-Suite who will ultimately make the decisions on any pricing changes. But as much as a CEO or CMO tries, and no matter what their title might say, there’s more profit and pricing power in the hands of the sales or customer service person who’s in the trenches every day. 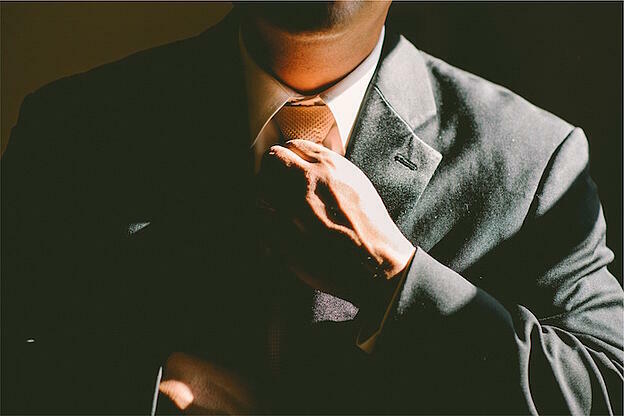 This power comes from the fact that these individuals are on the front lines, interacting the most with prospects and customers. Yet most companies we come across aren’t doing enough to create a culture of profit to inspire everyone to rally around the company’s bottom line, let alone keeping everyone aware of the company’s progress towards monthly and quarterly goals. But why should your whole team be in on company goals? Simple: teams that are more connected to the company’s financial progress grow more quickly. Don’t believe me? We’ve got data to back it up. Let’s walk through the data before discussing some ways that you can create a culture of profit in your company—and reap potentially huge benefits. To test the hypothesis that teams that are connected to the company’s financial progress grow more quickly, we collected data from a large group of SaaS companies that we’ve either worked with on pricing or who are users of ProfitWell. We kept the survey pretty simple, just asking what percentage of their team are consistently aware of the company’s financial progress (through dashboards, emails, revenue reports, etc.) and then comparing that to their three-month blended growth rate. What you’ll see in the output below is that there’s a clear correlation between the percentage of the team that’s connected and the company’s growth rate. While more research would need to be done to definitively answer whether or not cluing the team into metrics yields more growth (our sample size here was just 63, and there’s no experimental manipulation here), we’re pretty satisfied that we’ve supported our hypothesis, at least preliminarily. But the real question to dig in on is, "Why is this happening?" While we didn’t collect data that answers this question directly, our qualitative experiences and responses provide some insight that connected teams grow more quickly because there’s never a question of how the company is doing, consistently inspiring employees to act. First, when everyone’s aware of how the company is doing, there’s never any ambiguity surrounding good and bad times. If only a few up the chain of command know how the company is doing, mixed messages are easily sent during down times, which cause the team to think everything’s ok and potentially not work as hard. On the flip side, during peak times, teams may burn themselves out. As one ProfitWell customer recently expressed, “With the team connected to our monthly goals, when things are behind, everyone knows and is inspired to work that much harder. When we’re ahead, we know there’s a chance to celebrate a bit.” To put it plainly, reducing ambiguity forces everyone to beat to the same metric and know exactly the progress you’re making. While everyone rallying around the same goal is important, connecting everyone also allows inspiration to be put into action. While we’d always like a customer support rep to find ways to potentially upsell individuals coming through the support line, the interconnectivity of goals provides a constant reminder that everyone has an opportunity to make small changes to improve the company’s bottom line. After all, these small changes by a few individuals can add up to major impacts, pushing a small company into a behemoth. “Connecting everyone [to financials] allows inspiration to be put into action." Great—so how do you create a culture of profit? Well, the short answer is that it needs to come from the top of the company. The longer answer is that there are some basic things you can easily implement to push your company towards a culture of profit. We’ve seen daily goal reports work enormously well with our ProfitWell users. We designed these daily emails to keep everyone abreast of how the company is doing against the previous and current months’ goals. Surprisingly, we’ve found our open rates to be extremely high on these daily emails (60%+), supporting the notion that even the “rank and file” of the team are interested in how the company is doing. You can sign up for ProfitWell here (it’s free), but you can certainly do this on your own or at the very least give revenue updates on a weekly basis if the data is hard to pull for you. Similar to the daily progress reports, we’ve seen a lot of companies have success in putting up their metrics for everyone in the office to see. These constant reminders (potentially in the breakroom or in Slack/Hipchat if you’re a remote team) make sure that everyone’s at least tangentially aware of what’s going on. The biggest issue here is making sure you keep your metrics and numbers focused, because dashboards or feeds that are just a litany of numbers and widgets are more confusing than helpful. Finally—and this is the toughest of these ideas to implement—you need to trust your team and inspire them to make positive moves. Too many C-levels don’t give their teams enough agency to sell larger deals or upsell, especially when micromanaging different processes. If you trust you’re hiring the right people for the job, then you need to put up some guardrails, but not to the point of debilitation. You’ll be surprised at how big of an impact you’ll find comes from the places you least expect innovation. Creating a culture of profit is like any cultural consideration in your company—it’s a process. While we discussed a few mechanical moves you can make, there are plenty of different ways you can inspire your team around profit and your company’s goals. Just remember to be constantly testing and measuring different strategies, and, if you do nothing else, don’t keep your numbers a secret from the people who have the most influence on them: everyone.